Smith & Wesson have added an upgraded version of their Model 442 revolver to their Performance Center line. The new Performance Center 442 double action only revolver has a two-tone finish with a polished cylinder, screws and trigger. The new revolver, designed with concealed carry in mind, comes with Trace LG-105 Lasergrips. It is chambered for .38 […] Read More … The post NEW S&W Performance Center Model 442 Revolver appeared first on The Firearm Blog. 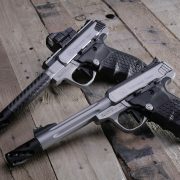 Smith & Wesson has upped the ante on their SW22 Victory pistols with some Performance Center loving. They now offer four new models of the Performance Center SW22 Victory pistol: two different barrel options with or without a Vortex Viper red dot. 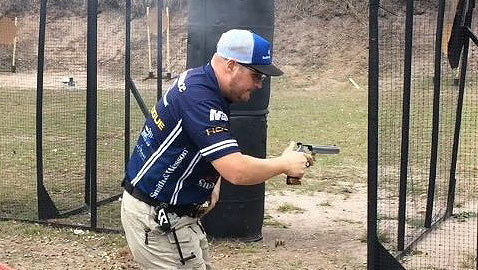 These will not only look like high-performance rimfire pistols, but should perform that way […] Read More … The post Smith & Wesson Delivers a Performance Center SW22 Victory Target .22 Long Rifle appeared first on The Firearm Blog. Smith & Wesson has a lot of popular firearms in their inventory, but there are some that definitely pay the bills more than others. That short-hand list likely includes the Sport II 5.56 NATO, Shield 9mm/.40 S&W, and the Performance Center C.O.R.E. 9mm. Keeping that in mind, even if Smith & Wesson has some golden geese […] Read More … The post S&W Upgrades Best Sellers with M-LOK, Mini Red Dots & Flat Dark Earth appeared first on The Firearm Blog. 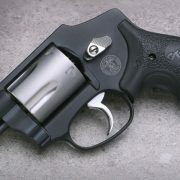 Smith & Wesson M642 Performance Center Revolver : Why Not Carry A Spiffy Snubbie? So I am always enthused to hear about new guns coming to market, after all, more guns on the market means more variety and more things for me to shoot. I like excuses to go shoot. 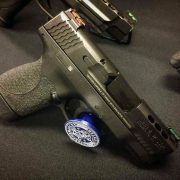 In a rather long press release, the Performance Center released their plans for 2017, among them was the new […] Read More … The post [SHOT 2017]Smith & Wesson Performance Center To Introduce New M&P Pistols as well as Performance Center Slide Kits appeared first on The Firearm Blog. Looks like Julie Golob let the cat out of the bag in regards to a few new Smiths coming to market. The new guns look pretty promising, it will be interesting to see some more detailed specs on them. Above each photo I copied the text from Julie’s post, this way you can hear it […] Read More … The post Leaked: New Smith & Wesson M&P10 in 6.5 Creedmoor and M&P45 Shield Ported appeared first on The Firearm Blog. 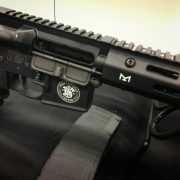 Many of you may be aware of Talo Distributors, Inc. for their special edition runs of popular firearms. 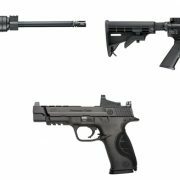 They list 13 different manufacturers with hundreds of cool and unique guns they have offered over the years. 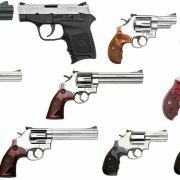 Smith & Wesson is included in this group, but they are quietly parting ways. It has not been stated […] Read More … The post Smith & Wesson Re-Labels TALO Edition Firearms as Their Own appeared first on The Firearm Blog. This would be a plinking, hunting, or offensive weapon. I think the S&W 8-shot from the Performance Center set up with a scope would be a good choice The lifetime warrantee is good as gold, what do you think?